Psoriatic arthritis (PSA) is a condition that affects people who have psoriasis, an immune system disorder that appears as reddish or silvery skin lesions. Symptoms of PSA include periodic inflammation of the joints and body tissues, including the heart, eyes, kidneys, lungs, and spine. A person may have symptoms of one condition alone for many years before signs of the accompanying condition show up. Diagnosing PSA can be somewhat complicated, as there is currently no specific test for the condition. There are, however, several approaches to diagnosis. When indicators of PSA surface, a blood test is often used to rule out rheumatoid arthritis. This test is negative in almost all cases in which PSA is present. Blood tests are also done to determine if a person has psoriasis. 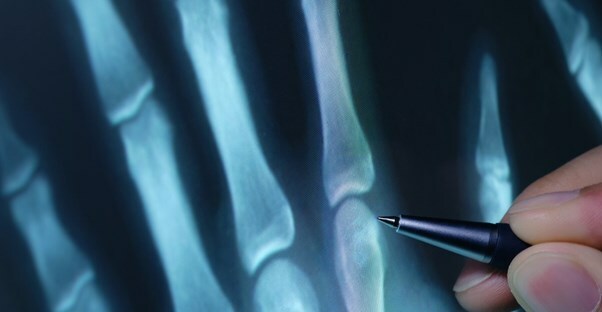 Doctors may also use X-rays to look for characteristic damage to the joints and fusion of finger and toe joints. PSA is diagnosed clinically, and the symptoms of arthritis and psoriasis are treated individually. Treatment for psoriasis may include topical applications, oral medication, biologic injections, corticosteroid injections, or light therapy. The arthritis symptoms are usually treated with exercise and nonsteroidal anti-inflammatory drugs. Usually, when one condition's symptoms are relieved, the other's are relieved as well. In more extreme cases, certain medications may be used to prevent joint deformity and destruction. These include hydroxychloroquine, corticosteroids, oral or injectable gold, leflunomide, sulfasalazine, and tumor necrosis factor blockers. All of these medications can have severe side effects and are prescribed for severe cases of PSA. Sometimes, surgery is used to repair damaged joints in patients. There are many PSA symptoms, and they can vary widely from one person to another. Joint pain and swelling, as well as tendinitis and fatigue, are some of the common symptoms. PSA has the potential to develop into a more severe joint problem. For this reason, an early diagnosis and subsequent treatment can reduce inflammation and minimize or stop damage to the joints. If you are suffering from this condition, it is important to follow your doctor's recommendations for relief of symptoms.